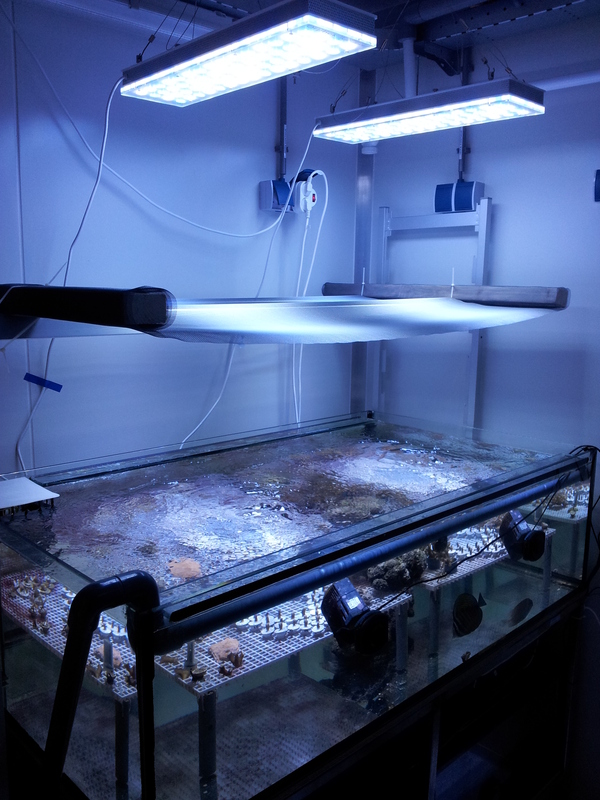 The use of LED lighting has been increasing in recent years in the saltwater hobby industry so it is no surprise that these type of lights are now also being used for scientific research. My name is Arjen Tilstra, I am a graduate student at the University of Groningen (Netherlands) with a BSc in Marine Biology, Ecology & Evolution. I fell in love with corals when I was 15 and saw a small saltwater tank at a friend’s house. I had to have one! This was 14 years ago. In the meantime I had three tanks (one nano tank), all with mixed results. Unfortunately I had to quit several years ago because of the costs and my study. Nevertheless, my experience in keeping and maintaining soft- and stony corals come in handy now. In March 2012 I started dreaming of doing my very own research project. Usually graduate students enroll in existing research projects performed by PhD students and/or Post Docs. First things first……a supervisor. In retrospect this was the easiest thing of them all. Immediately he was enthusiastic about the idea. My idea came when I was writing my BSc thesis. A 2002 paper by Brown et al. caught my attention. A reef near Phuket in Thailand experienced a bleaching event. But this wasn’t an ordinary bleaching event. They saw that the West part of the reef suffered less from the bleaching event compared to the East side. The question was why!? They tested several hypotheses and concluded that the only known difference between the regions was the light intensity. The West region experienced higher light intensity in the months prior to the bleaching event. My goal was to simulate similar conditions but in a controlled setting. After checking all papers that cited the paper, I couldn’t find a single paper that did similar research. A new project was born! 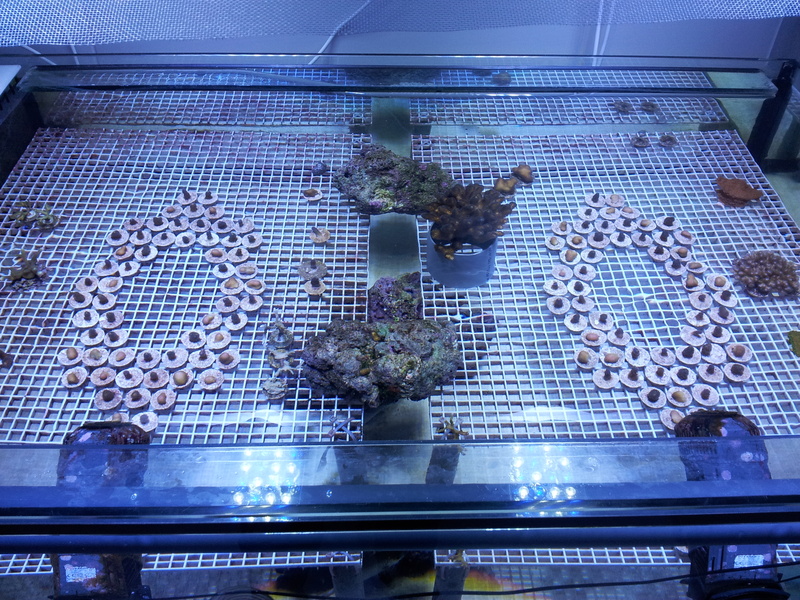 I was going to expose coral frags to different light intensities and expose them to an artificial heatwave. Before I continue I want to stress out that bleaching is not what most aquarists think it is. It is not the loss of coral tissue that exposes the white skeleton underneath. It is the loss of zooxanthellae and/or (photo)pigments. When a coral is bleached it is still alive, it is the white skeleton that “shines” through the tissue. If conditions settle back to normal and free living zooxanthellae are present, the coral can become viable again. If not then the coral eventually dies. My supervisor told me the disadvantages of doing my own project; I had to pay for almost everything myself. Of course I could use the universities facilities and I could be reimbursed for about a fifth of all costs. In my time as an aquarist I made lots of friends in the community and made a name for myself on Dutch website www.zeewaterforum.info. A Dutch forum where all hobbyists come to hang out and share information. I contacted Jan Harbers (admin) and asked if I could approach the forums sponsors for help. No problem……and so it happened. Offers for equipment came flooding in and I was pleasantly surprised by the sponsors enthusiasm. A key issue for this project was of course light! Tanne Hoff called me with an idea. Maybe Orphek was interested! Via Tanne I came into contact with Ofir and the Dutch importer Arie from AquaCompleet (a well known Dutch retail store). Ofir was immediately enthusiastic and generously sent me two lamps to work with. Two 18000 Kelvin DIF100 XP’s (Fig. 1). 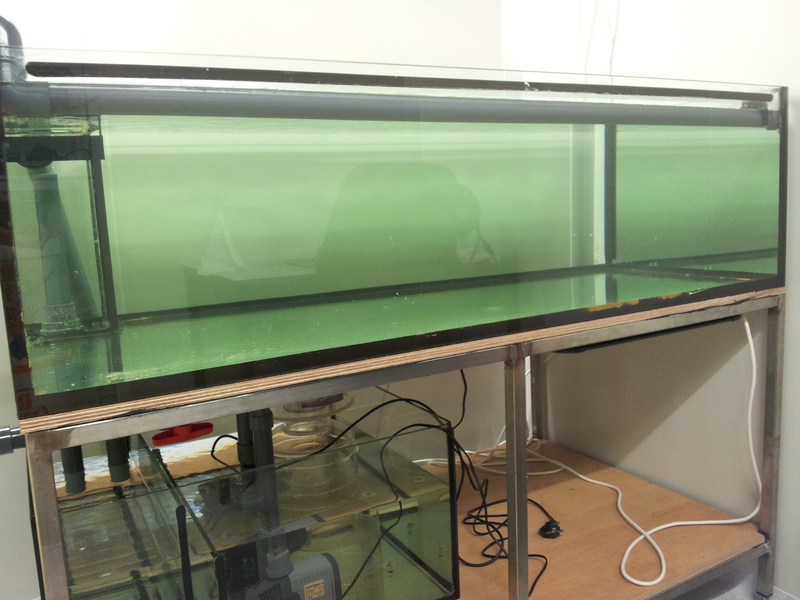 As a comparison I added a picture of the tanks without lamps and filled with tapwater (Fig. 2). The difference is amazing. 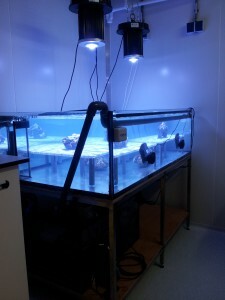 Due to a lack of underwater light meters I couldn’t yet create the perfect setup for the experiment. I won’t bother you with the entire experimental setup but in a nutshell I had to create two different light treatments as to simulate the West and East as in the Brown et al. (2002) paper. 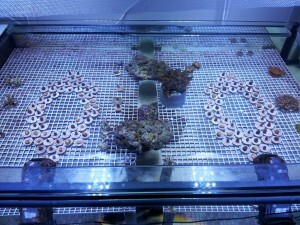 In the meantime some live rock and test frags were added as well as 2 fish and several invertebrates. They were all doing extremely well. Coloring of the test frags was beautiful (even though beauty is subjective). But coral color is not something I’m interested in necessarily. Could I create an environment with a uniform spread of light with the amount of frags that were needed for my research? Unfortunately no, the dispersal of light was too big. Seeing as this would be detrimental for my research I immediately contacted Ofir and explained the situation. After a tong in cheek remark that I was costing him a lot of money he told me; no problem, new lamps will arrive soon. Several weeks later Arie came by with two new lamps. Two PR-156’s (Fig. 3)! The DIF’s were taken back by Arie. He could them for a different project. I was very impressed with the DIF’s but the PR-156’s were even more impressing. A very different lamp since the area in which the LED’s are distributed is much smaller in a DIF. The first measurements looked promising. 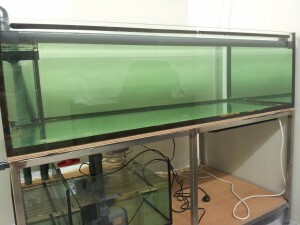 40cm’s above the tank, the test frags received 900 ?mol m–2 s–1 of light. 70cm’s above the tank they received 450 and eventually I hung them a meter (highest possible in my setup) above the tank where they received 300 ?mol m–2 s–1 (Fig. 4). 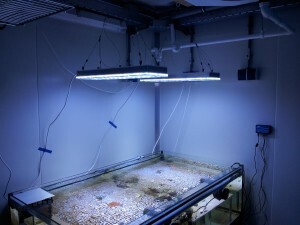 Since the distribution of LED’s in the lamp was more spread the light in the tank was also more uniformly spread. Excellent! This project is also supervised by PhD student Tim Wijgerde (MSc) and Dr. Ronald Osinga from the Wageningen University (Netherlands). 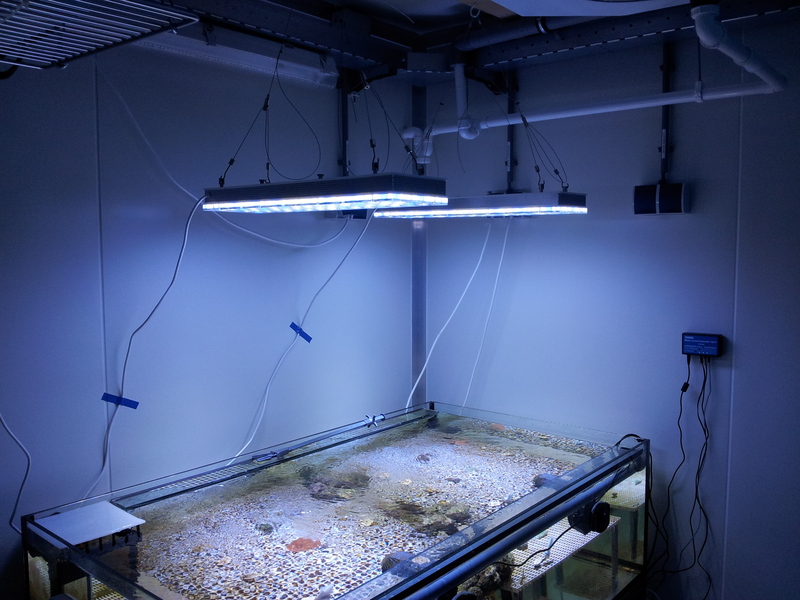 Together with Tim we did several measurements to see how best to place all frags and in congruence with Sanjay Joshi’s (PhD) article on Advanced Aquarist I decided to distribute all frags in an oval shape underneath the lamps (Fig. 5). (Fig. 5) all frags in an oval shape underneath the lamps. The dispersal is now within a 10% limit. Because the light is so strong and the fact that I couldn’t hang the lights any higher I had to come up with a different way to dim the light. I needed 200 ?mol m–2 s–1 and so I set up a very amateur setup to dim it (Fig. 6). But it works, it captures approximately 33% light and thus the light intensity is a solid 200±10 ?mol m–2 s–1 for the frags. While many of my collegues have to deal with reductions in light intensity with their (T5) lamps my experience with the LED’s is more than positive. I haven’t noticed any reduction/change in intensity or spectrum. In the long run this can save us money because we no longer have to buy expensive bulbs for whatever light source is used. Also, the heat emitted from the lamps is minimal and the amount of light astronomical. Thusfar I can honestly say I have no complaints whatsoever apart from the fact that they have to hang high because the corals would otherwise be stressed from overexposure, but this is more a luxury problem than an actual problem. It is now almost July 2013 and after more than a year of preparations finally the first data is obtained. This experiment will run until September and after publication in a science journal I will write pieces for popular magazines and websites. We also make weekly pictures of 18 randomly selected frags to see their progress. One of those frags can be seen in Fig. 7. This is two weeks of change. For now I want to thank Orphek and Ofir in particular for his interest and contributions to my research.